Welcome to the easiest make-ahead breakfast ever. These types of egg muffins are pretty popular now, but in case you haven’t seen them making the internet rounds, here you go: your new grab-and-go breakfast best friend. These are so simple, versatile, and fast to throw together that you can easily make a batch on a Sunday evening and be set for the week. The recipe here is for a half-muffin pan (6) recipe, but feel free to double it to make a batch that would fill a full muffin pan (12). A quick-to-assemble make-ahead breakfast to set your week up for success. Put the mushrooms, onion, peppers and cheese into a bowl. Crack eggs and scramble, then mix into all other ingredients in the bowl. 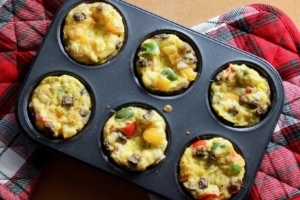 Pour ⅓ cup of the mixture into each cup of a greased (6-cup) muffin tin. Bake at 350 for ~22 minutes, or until cooked through (done when a knife inserted comes out clean). Last note: the ingredients that I used in this were just the ingredients that I had on-hand, but feel free to use whatever you have or like. These are a great way to sneak some vegetables in first thing in the morning, providing a fantastic protein and fiber combo to give you a strong start to your day.